Accueil / Another CBDC Success Story - MacAusland’s Woolen Mills Ltd.
Another CBDC Success Story - MacAusland’s Woolen Mills Ltd.
MacAusland’s Woolen Mills Ltd is one of PEI’s oldest businesses. It started as a sawmill and gristmill in 1870 then began producing woolen yarn in 1902 and in 1932 started producing woolen blankets. The business has since passed through four generations of MacAuslands who have established themselves as a proud family business known for producing their namesake, “MacAusland Blanket.” The business was founded by Fred MacAusland and is now the only mill in Atlantic Canada still producing traditional blankets of 100% virgin wool. Dale MacAusland and Alex MacAusland are each 50% owners in the company. They are fourth generation owners and have decades of experience in the industry. In 2015, CBDC West Prince Ventures Limited was approached regarding an asset purchase plan. Initially, MacAusland’s utilized the CBDC CASP program for business plan mentoring along with an analysis of new technology adoption. Following this project, the MacAusland’s followed through with their plan to acquire a new textile weaving loom from Europe. The new loom would replace old equipment and create efficiencies and increased production. CBDC was very pleased to assist with financing the new equipment on this project. 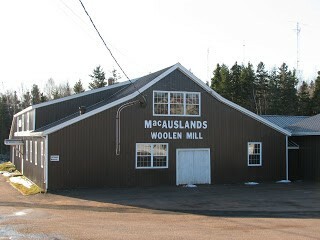 MacAusland’s Woolen Mills currently maintains 11 employees and have built themselves a reputation for quality wool blankets and yarn not found anywhere else in Atlantic Canada.